It has been a little while since I’ve had a chance to visit the parks, so I took a day to catch up on all the goings on at Universal Studios Florida, and grab some video as well! Since my last visit with a camera, Twister and Disaster have closed and themed construction walls have gone up around their locations where Race Through New York Starring Jimmy Fallon and Fast & Furious Supercharged will be built, respectively. 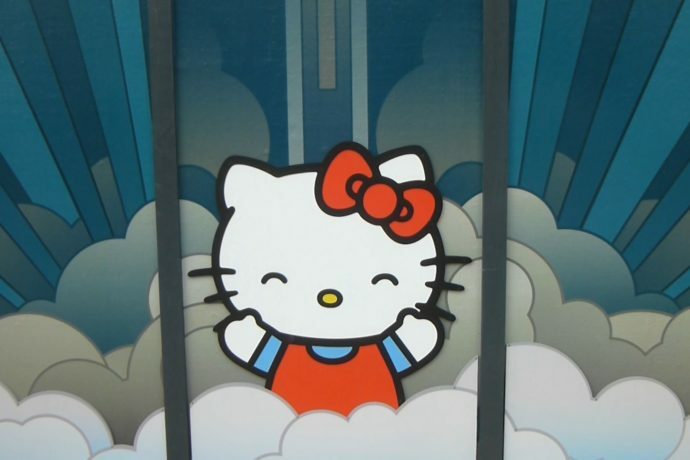 Themed construction walls have gone up around the future site of the Hello Kitty store/experience. This is the first actual confirmation that the new Sanrio themed store will definitely be taking over the former site of Lucy: A Tribute. Some other minor work has been going on as well, including some sort of small building being constructed near Despicable Me, behind the main Studio Store. It looks like it might be storage or a permanent refreshment stand, either way, nothing too intriguing. Two new shops have opened in the park recently: the new Williams of Hollywood Prop Shop featuring props from various attractions and stores, and a new year-round Christmas store. And since it’s December, the holidays are in full swing at the parks, with garland strung everywhere and large Macy’s balloons littering the park. Check out the video for full coverage or the screenshots below for more details! And stay tuned for Kong coverage next week! Ornamental piece of concrete with Lucille Ball’s initials removed. The holidays are in full swing and Macy’s balloons are everywhere! Thanks for visiting! That’s all for this week. Do be sure to check in next week for Kong coverage and Islands of Adventure news.